Hey all, I’m Nikoo, joining The Orchard team as Interactive Marketing Manager in the UK. Previously, I was head of Digital Marketing training at Music Ally, where my over-excitement about great marketing campaigns led me to also write the “campaigns” section for Music Ally’s digital marketing magazine Sandbox. I moved to London about three years ago from Sweden. Like all Swedes, I have worked at IKEA (it’s part of a government scheme ;) ). In a time “before music,” I used to design kitchens. If you ever need any help with that, I’m here! Outside of work I sing in a choir, run my own music/art/spoken word events, help out R&B singer Ayelle and am part of the Glastonbury Rum Shack production crew. But mostly I enjoy hearing people’s stories and eating my mum’s Iranian food. 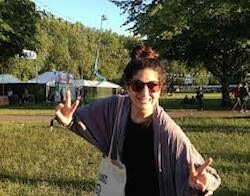 The Orchard is excited to welcome Nikoo Sadr to our London team, reinforcing our commitment to providing innovative and purposeful label services. Find out more about our growth in the U.K. in our official press release.